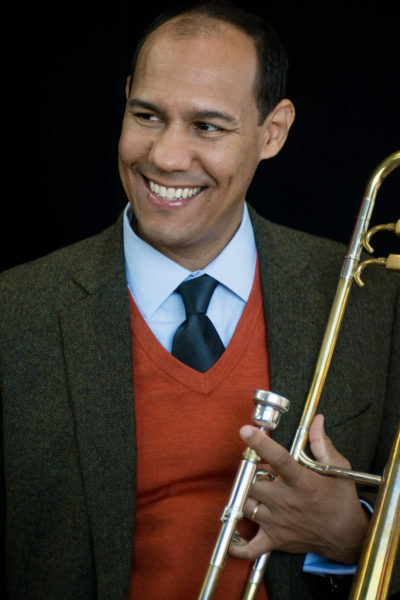 Jason Jackson has been one of the busiest and most respected trombone players in New York City since settling there 21 years ago. In addition to the two years he spent touring the world with Ray Charles not long after his arrival, he has been the lead trombonist in the Dizzy Gillespie All-Star Big Band for the past decade and also currently plays that part in orchestras led by Roy Hargrove and Charles Tolliver. And on Mondays, his off- nights from playing in the pit bands of such Tony Award-winning Broadway productions as The Color Purple, Wonderful Town, Nice Work If You Can Get It, and presently Motown the Musical, he has been a member for the past 10 years of the Grammy Award-winning Vanguard Jazz Orchestra at the Village Vanguard. He also performs about once per month in a group he co-leads with his wife, vocalist Rosena Hill Jackson, and even finds time to occasionally sit in at jam sessions.